Fried turkey is a great way to quickly cook your bird for the holidays. You will get crispy skin, moist meat and a free oven to cook your sides. All you need is some simple ingredients and a safe technique to get the best experience. You will need the following items to safely fry your turkey. 1. Place your turkey while in the bag into your frying pot, then fill with water until the turkey is covered by one inch of water. Remove the turkey and mark where your water line is. That is how far up you should fill the pot with oil. 2. Place your brining ingredients into a saucepan, bring to a simmer and stir to dissolve the sugar and salt. Remove the brine from the heat and let cool. 3. Remove your turkey from the bag, drain any juices, remove any plastic and bag 'o' organs from the inside. 4. Place the turkey in a cooler or large stockpot with lid. Pour the brine over the turkey and then stir in the ice. The turkey should be totally under icy water. Brine for 12-16 hours, and it is important to keep ice cold during this process or your turkey will spoil. I like to keep it outside during this time. 5. Remove the turkey from the brine, drain and dry very well, then set out at room temp for 90 minutes to remove the chill from the bird. 6. Place the frying pot on your outdoor burner at least 10 feet from your house, preferably on concrete. Attach the candy thermometer and fill up with oil to the water mark you made earlier. Turn the heat on and heat the oil up to 350 F.
7. Tie the legs together with butchers twine and dry the turkey with paper towels one more time. Very slowly hook the turkey legs using long tongs or a meat hook and lower into the oil. Keep kids and pets away during this time. 8. Cook the turkey for about 25 minutes at 350 F. Adjust the fuel as needed to maintain the heat. With a friend carefully bring up the turkey halfway out of the oil and check the temperature of the bird using a stem thermometer. The deepest part of the thigh, not touching bone, should register at 175 F. If it needs more time, fry for another 5-10 minutes. 9. Remove the turkey from the oil and place on a clean platter. Let the turkey sit for 20 minutes before carving. Why Pressure Cookers are Awesome! Why Pressure Cookers are Awesome!!! Pressure cookers use high pressure to cook foods faster and more efficiently than other cooking methods and are a great tool to have in the house. This is how they work. There is a large pot, about 8 quarts, with a lid that locks into place. You add ingredients and a flavored liquid like stock, wine or juice into the pot and start to heat it up. When the liquid in the pot starts to boil, the pressure builds up to 15 psi (pounds per square inch). This causes the liquid to boil at 250 F instead of 212 F. You also have high pressure locked in the pot, forcing the heat and flavor into the food instead of boiling away. With higher temps and pressure your food cooks faster and with more flavor. 1. Quick Cooking – Using high pressure and hotter liquids you can cook meat dishes (beef stew, chili, ribs, pork carnitas, roasts and chickens) and grains and dried beans (wheat berries, chickpeas, navy and black beans) in a fraction of the time. This can reduce cooking times for things like a whole chicken from over and hour to just about 20 minutes. 2. Great Value and Space Saver– Pressure cookers cost between $50 and $100 based on the materials they are made from, generally aluminum or stainless steel. Given the cost, a pressure cooker can take the place of many kitchen tools like a large soup pots, steamers and rice cooker. 3. 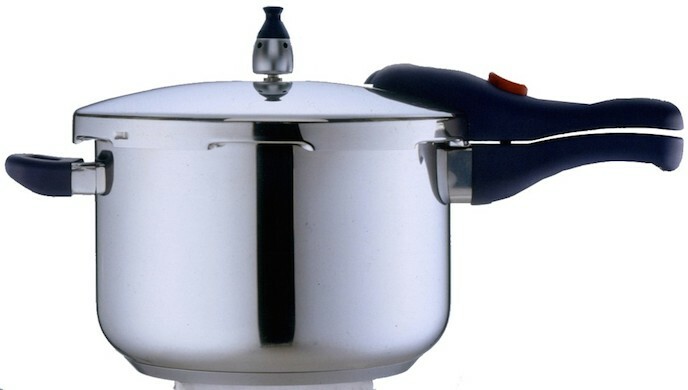 Safety – Pressure cookers have gotten a bad reputation over the years for safety issues. Apparently back in the day pressure cookers did not fully lock into place. This would cause bad blowouts resulting in huge messes and bad burns. Todays pressure cookers have simple safety features and locking mechanisms that ensure you can cook safely and easily. Check out this video link below for a great way to cook a chicken in your pressure cooker. Food Poisoning 101: What to do if it happens to you! Food poisoning can be with out a doubt the worst feeling in the world. The symptoms can be very ugly and include upset stomach, vomiting, diarrhea (sometimes at the same time), cramping, chills, dehydration and sensitive skin. This can last from 24 hours to several days. 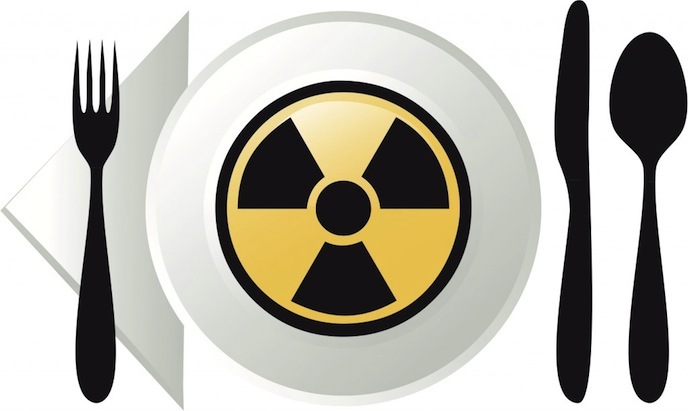 Food contamination can be caused several ways. The main reason is the mishandling of food using bad cleaning, storage, cooking and serving techniques. Another cause is due to the spread of germs, bacteria, viruses in the food and the people cooking your food. Lastly food can be contaminated by physical stuff like cleaning products, bugs and trash. Get those germs out of your kitchen! The best way to prevent food contamination is to keep your kitchen clean and organized. Here are 4 easy ways to keep your kitchen safe for food preparation. Washing your hands often with soap and hot water is the first and biggest defense against food poisoning. Keep hot foods hot (above 140 F) and cold foods cold (below 40 F) during preparation, storage and service will keep them safe for eating. Store hazardous foods like raw meat away from fresh fruits, vegetables, grains and cooked foods. Regularly clean (removing visible gunk) and sanitize (removing microorganisms) your kitchen and tools thoroughly using plenty of soap, hot water and in some cases cleaning products with bleach. What to do if you get sick? If you do get food poisoning from someones home, report it to them immediately. If you got sick while eating in a restaurant, report it to the establishment. If they are not responsive, contact your local health department. You will be asked about the date, time, the food that you ate and the symptoms you have. They will contact the establishment and run through there kitchen's cooking and sanitation procedures. If you do get sick, contact your doctor immediately. They will be able to let you know how you should proceed. Eating and drinking will be the last thing on your mind but, you must keep hydrated while going through the sickness. Try sipping warm tea with ginger, water, Pedialyte and attempt to eat something light like broth or a banana. Food poisoning may not happen to you often, but it is something that society deals with everyday. Now that you know what causes it, you can be ever vigilant against it in your home. Pre heat the grill over medium heat. Marinate the chicken for up to 2 hours in the fridge. Clean and oil the grill well. Grill the chicken on both sides until cooked through, about 3 minutes. Garnish with lemon slices and sprigs of fresh rosemary. 1. Do not panic. Keep cool, assess the problem and proceed with steps 2-5. 2. Safety First! Put shoes on your feet and move any kids or animals out of harms way. 3. Do not sweep up broken glass because you will get glass in the broom. Remove large pieces of glass with a pair of tongs and place them in a thick brown paper bag. 4. Carefully wipe up the small shards of glass and surrounding surfaces with a big wad of wet paper towels and repeat 3 times. Place the towels in the brown paper bag to throw away. 5. Dry the area well and repeat the wet wipe down if necessary. Cooking with a good frying pan can be the difference between a successfully prepared dinner and a big fat mess. You can use a frying pan to fry, steam, sauté or simmer vegetables, fruits, meats and grains with ease. A great pan should be comfortable to use, good for a variety of cooking methods, be reasonable priced and most important, last a lifetime. Shopping for a good pan can be a costly and mind numbing task. Just walk into any housewares stores and look at all of the sizes, shapes, materials and celebrity name brands, its ridiculous. From shiny stainless steel, heavy cast iron and the countless space aged nonstick surfaces available, how is one to choose? This post will give you a good idea of what to buy when you purchase your next set of frying pan. Nonstick pans are everywhere these days. They are easy to use and clean, lightweight, are cheap and can be found everywhere. My issue is that they cannot be used over high heat, are not oven safe and you cannot use metal tools with them. The big huge problem is that the surface scrapes off into your food and can release toxic fumes over high heat. *Do not buy nonstick pans, they stink!!! These can be a great option for cook. They look great and cook foods evenly. I like the all clad style that holds heat evenly, are solidly constucted and are oven safe. The down side is that they are not nonstick so you need to use oil, good heat control and they can be hard to clean. 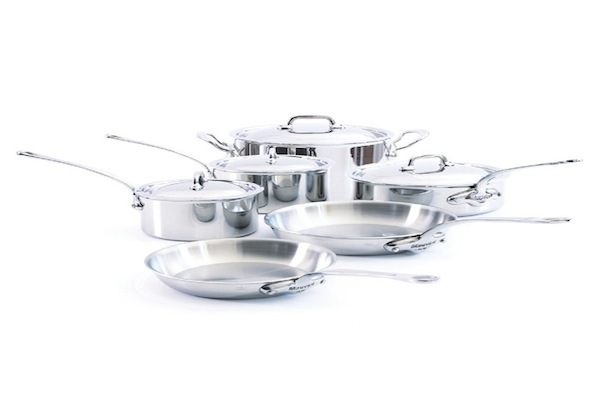 This is link for one of my favorite pans made by Tramontina and available at Walmart for a great price. These heavy-duty pans have been around for over 400 years. They hold heat evenly, are non-stick, oven safe, inexpensive, easy to clean and literally last forever. Cast iron pans need to be seasoned with oil and salt before cooking food to build up the non-stick surface. You need to be careful with cast iron because they are very heavy and smoke like crazy over high heat. When cleaning, scrub well using hot water only and lightly oil after every use. You want to keep that seasoned nonstick surface in place and soap will wash it right off. I like the Lodge brand of cast iron and it can be found in any home good store or department. 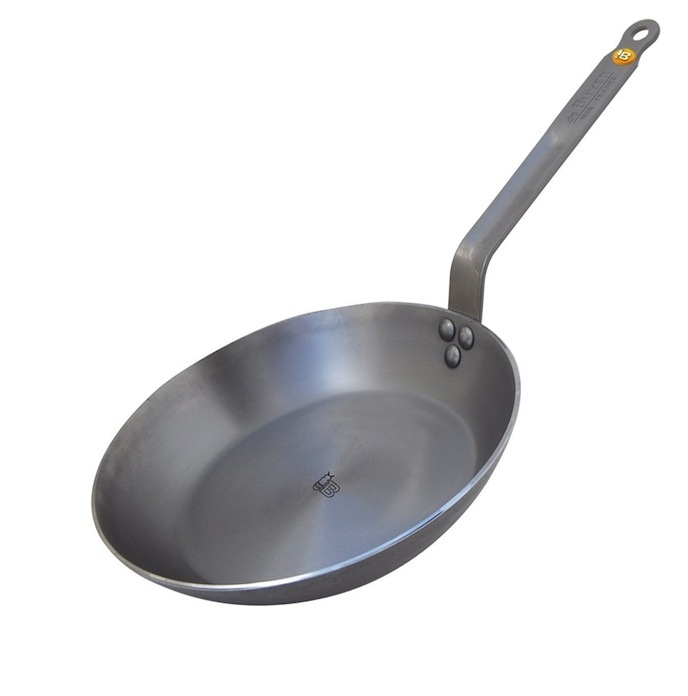 These are commonly used in the restaurant industry and are know as "French pans". They are light, heat up very quickly, oven safe, turn non stick after several uses and are easy to use. Just like cast iron they do need to be scrubbed with hot water only, to hold the seasoned nonstick surface. I just started using these pans and really like the ease of use and cleaning. Packing your own lunch can be the easiest and most tasty way to make sure your new year starts out healthy and happy! 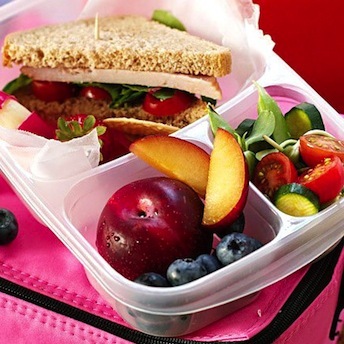 Follow these easy lunch packing tips to make sure you have a lunch that will give you the energy you need to be productive throughout the day. Make a lunch that you want to eat, not one you feel you have to eat. This will decrease the chance that you will go to convenience for your meal or trade your unacceptable menu items with your friends. When making a sandwich, pack moist items like lunchmeat, tuna and chicken salad, lettuce, tomato, mayo, and mustard separately from the dry bread. All you have to do is assemble the sandwich at your lunch table for a fresh made experience. Who wants a limp biscuit? How cold? Ice cold! Use a frozen juice box as an ice pack to keep lunches fresh. Incorporate soups, chili and casseroles into your weekly menu. If you do not have access to a microwave, invest in a small thermos to keep hot foods hot. I just got one for the holidays and could not be happier. Fiyah! Oh Yeah! Reheat last night's dinner and throw in an easy side salad or chopped fruit for kicks and giggles. Cook large portions of food when you have free time and separate it into containers that can be reheated. Just don't let your lame roommate or sceevy older brother get hold of your grub. Pack chips, pretzels, cookies, crisps and delicate items in small reusable containers. Place hard items at the bottom of the bag and soft items at the top. It's like Tetris but with food. Replace artificial sweets and desserts with natural options like fresh fruit with honey or peanut butter, granola, dried fruits, fruit leathers, nuts, yogurt, and natural fruit juice based cookies and snacks. What does "Organic" and "All natural" really mean? What does "Organic", "All Natural" and "conventional" terms really mean? When you walk into the grocery store there are a lot of words that are thrown around to describe how your food is produced. Words like "all natural" and "organic" are used as sales tools to get you to buy, buy, buy. As a chef I get asked all of time about these products and if the price and quality are really worth the purchase. In this post I am going to tell you what these words actually mean so you can make an educated decision for yourself while at the grocery store. First things first, the USDA refers to the word "organic" as food that is grown or produced with no synthetic pesticides, herbicides, irradiation, solvents or additives. The soil that the food is grown in actually needs to be free from those chemicals as well for a 7 year period. Organic meat is produced by feeding the animals organic food throughout its life. Pesticides and herbicides are treated on crops to help eliminate insects that tend to harm the food, but the pesticides can be harmful to humans. The concern is that our food chain of plants, animals, humans and mother earth will absorb harmful chemicals like pesticides and herbicides. As these chemicals build up in our bodies they can potentially create havoc on our health and immune system. These chemicals can also build up in the soil and leach into the water system. How great does that sound? The term "All Natural" means that the food does not have any artificial colors, flavors, preservatives, antibiotics or growth hormones. These products can include many packaged and frozen products as well as meat, seafood, dairy and eggs. "Conventional" foods can contain artificial ingredients, pesticides, herbicides and pretty much any other weird and nasty stuff a company wants to throw in (like pink slime and hydrogenated fats). Most of the food in the grocery store that is not specifically marked "organic" or "all natural" is considered to be a conventional product. The fact is that foods marked "organic" and "all natural" generally are going to cost more at the register. The big reason for the increased cost to you is because it takes more labor, resources, facilities and quality ingredients to produce these products. Should I buy these foods? Factors like budget, proximity to quality grocers and lifestyle can make it easier or harder to try these new foods. Luckily larger grocers, big box stores like Walmart and Target as well as local natural food markets and farmers markets are making it easier to find and purchase these types of foods. Is the cost worth it? Now that you know the difference, it's all up to you my friends. I love BBQ, next to Tacos it is my all time favorite food. 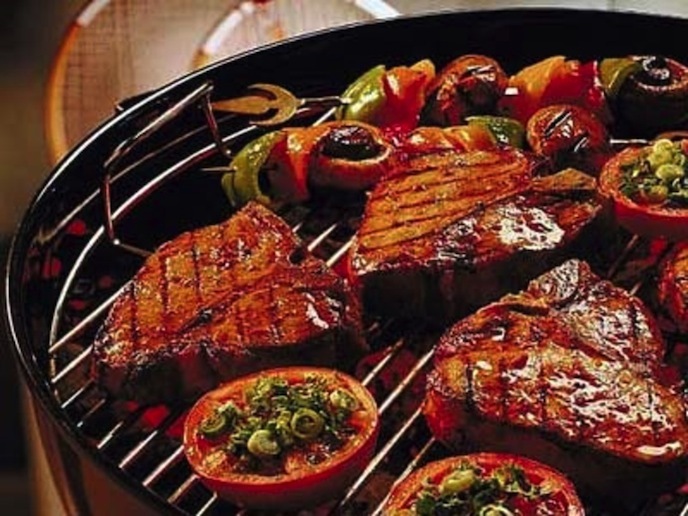 BBQ is an American staple with influences from all over the world. From Brazillian churrasco, slowly roasted Thai suckling pig and Middle Eastern kabob to the many regional styles in the states, BBQ is one of the greatest and most delicious culinary feats ever! Roasting, smoking and slow cooking cuts of meat over long periods of time comes from our ancestors need to utilize tough inexpensive cuts to feed large families. This cooking process leaves you with the most tender and mouth watering meats dishes. Follow these simple tips below to make sure your grilling experience is easy, fun and successful. 1. Clean your grill well before cooking to reduce carbon build up, sticking foods and to get great grill marks. Start with a wire brush or a ball of tin foil. Next, heat the grill; clean the hot grates with a wet rag and tongs. When the grill is clean and hot, rub the grates with oil to season. 2. Do not marinade meats in marinades and sauces with sugar. This will cause the sugars to burn on the meat before it cooks through. Cook meats thoroughly before slathering with BBQ sauce. Once the sauce is on then you can char it over high heat before serving. 3. Start thick cuts of meat over medium/ high heat to create a seared crust that seals in flavor and juices. Once the crust has formed, place the cut of meat over medium low heat to cook through. 4. You can use the grill to cook fruits and vegetables. Keep these foods in large pieces when you place them on the grill so they don't fall through. Skinny veggies like asparagus and carrots can be placed across the grates to prevent them from falling though to the fire below. 5. KISS – Keep It Simple Stoopid! There are a million sauces, seasonings and marinades on the market and they will all give you vastly different results. Remember to keep it simple! A little olive oil, kosher salt, pepper and lemon will take you a long way with most grilled foods. This classic combination tastes great on grilled fish, seafood, meats, veggies, fruit and even baked good. *Remember to be safe when grilling. Keep the grill set away from the house, awnings or anything that can catch fire. Most importantly, keep all kids, pets and drunk people away from hot grills when you are cooking a coolling the grill. Picking a good cutting board is different for every cook. 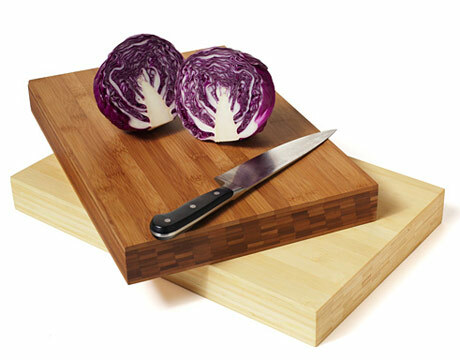 Cutting boards come in different design, sizes, colors, shapes and materials. The key is to find one that feels right to you and is suitable for what your needs are. I like a big, plastic cutting board about 18 in x 24 in. This can be used for slicing and dicing as well as creating a huge space for all of my culinary adventures. Good cutting boards are made from plastic, bamboo or wood. These options are easy to clean and will give you good blade control. Your board should also be strong and have good weight. Thin, wimpy cutting board are not safe to chop on because they can slip around. Bad cutting boards are made out of materials like stone, glass and acrylic. Personally I can't believe they still sell these types of boards. If you have one I suggest you use it as a serving platter and call it a day. Not only will they dull your knives, but they are slippery and can cause your knife to slip on the blade as you cut. You should always clean your board after every use and dry it well. This will help stop odors and bacteria from growing. You can easily wash your boards with soap and hot water. A squeeze of lemon will also keep your boards smelling fresh. When you are cutting raw or cooked meats a good scrub with diluted vinegar or bleach will do the trick at killing germs. To avoid cross contamination, use a separate board for vegetables and fruit and another for raw and cooked meats. When you are cooking, always prep and store veggie type foods before breaking out raw meat. 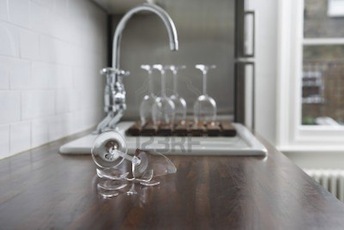 This will cut out any chances of cross contamination in your kitchen. Cutting boards should be cleaned and air dried completely before storing. If you store a wet cutting board there is a a good chance that germs and bacteria will start to grow and that's just nasty! When you are using your cutting board, make sure to place a wet rag underneath. This will keep it from slipping around while you cut. A quality plastic or wood cutting board will give you a good surface to make your slices and dices while keeping your knives sharp and your fingers safe.